I'm sure you've noticed the (painfully obvious) pattern emerging in my cooking/baking posts versus those recipes designated as Stephen-favorites. Mine are full of fat and sugar -- cookies and cupcakes mostly. Some apples sparkling with sugar. Veggies bathed in coconut milk. Stephen's, however, are teeming with veggies and lean protein. He is truly the yin to my yang. 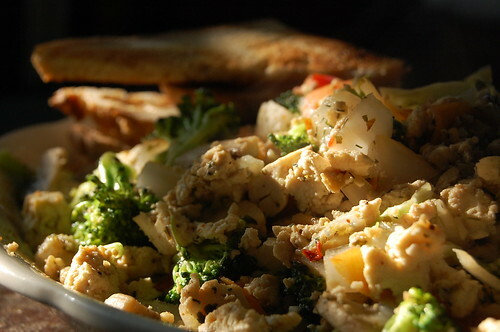 Despite your dietary preferences, curried tofu scramble works for any meal. Stephen enjoys it as a hearty post-run breakfast on Sundays . . . while I most enjoy it at night. With several slices of buttery french-bread toast.